Scheduled for release alongside the new UAD Software (v6.3.2 - out in early November) Universal Audio has announced a new Shadow Hills mastering compressor and Precision K-Stereo Ambience Recovery plug-in. 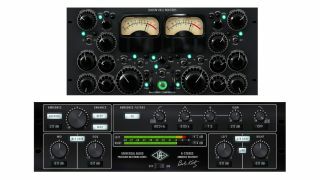 The Shadow Hills plug-in is a software emulation of the legendary hardware mastering compressor. It was designed in collaboration with Shadow Hills founder Peter Reardon and built by plug-in whizz kids, Brainworx. The Precision K-Stereo Ambience Recovery is a new concept that was built in collaboration with famed mastering engineer Bob Katz. It's designed to lift the ambient cues from recorded material and enhance the depth and imaging without artifacts. Full details below. The Shadow Hills plug-in will cost $299 and the Precision K-Stereo Ambience Recovery plug-in will go for $199. Plug-Ins platform and Apollo Audio Interface. Created by Universal Audio in collaboration with famed mastering engineer Bob Katz, the K-Stereo Ambience Recovery plug-in extracts ambient cues from source recordings — allowing users to precisely enhance the stereo depth and imaging of mixes without unnatural artifacts. "The K-Stereo plug-in gives mastering engineers an easy, organic-sounding solution for excessively small mixes or mixes that need more space and depth — from classical to jazz, rock, or hip-hop," said Bob Katz. "Because we're effectively 'pulling out' the ambience that's already in the recording, the results sound much more natural. I'm happy to be working with UA to bring K-Stereo to the UAD platform." Designed for critical 2-track mastering or post-production applications, the K-Stereo plug-in offers a "do-no-harm" approach to adding depth and width to busy or narrow-sounding mixes. Using elements of the Haas effect and other psychoacoustic principles, the plug-in transparently enhances existing ambience and early reflections without adding artificial reverb or changing the ratio of center elements to side elements. Available as part of the upcoming UAD Software v6.3.2 release, scheduled for early November, the Precision K-Stereo Ambience Recovery Plug-In will be available for $199 US via UA's Online Store. Universal Audio (UA), a leading manufacturer of professional audio recording hardware and software, is pleased to announce the impending release of the Shadow Hills Mastering Compressor Plug-In for the UAD Powered Plug-Ins platform and Apollo Audio Interface. Created by UAD Direct Development partner Brainworx® and Shadow Hills Industries founder Peter Reardon, this true-to-life plug-in emulation of the hallmark Mastering Compressor expertly tempers dynamics and tames transients like no other device on the market. "The Shadow Hills Mastering Compressor hardware is capable of delivering so much character and color, from subtle to very dramatic. It was important to me that any plug-in emulation provided the same sonic experience," said Shadow Hills' Peter Reardon. "Thankfully, the team at Brainworx and Universal Audio have faithfully brought this hardware product to life in the digital world." As the go-to compressor on recordings by Muse, Gnarls Barkley, Coldplay, John Mayer, Regina Spektor, and more, the Shadow Hills Mastering Compressor features a world-class signal path, controlling music dynamics in two stages — first with an Optical section, then with a Discrete (VCA) section. Both sections can be bypassed, providing a variety of compression sounds (Optical, Discrete, and combined) from a velvet touch to an iron fist. Like the hardware version, the Shadow Hills Mastering Compressor plug-in offers selection of three distinct output transformers (Nickel, Iron, and Steel) — taking the signal from "clean" to "colored" and "dirty" — as if selecting from the output stages of three distinct classic analog consoles. Whether employed on a vocal chain, drum buss, or on the master fader, the Shadow Hills Mastering Compressor's unique control and character will inspire creativity. Available as part of the upcoming UAD Software v6.3.2 release, scheduled for early November, the Shadow Hills Mastering Compressor will be available for $299 US from UA's Online Store.